First line: This was going to be a solo show. From the back cover: Alice Cohen was happy for the first time in years. After a difficult divorce, she had a new love in her life, she was raising a beloved adopted daughter, and her career was blossoming. Then, she started experiencing mysterious symptoms. After months of tests, X-rays, and inconclusive diagnoses, Alice was sent for an emergency CAT scan that revealed the truth: she was six months pregnant. At age 44, with no prenatal care and no insurance coverage for a high-risk pregnancy, Alice was besieged by opinions from doctors and friends about what was ethical, what was loving, what was right. With the intimacy of a diary and the suspense of a thriller, What I Thought I Knew is a ruefully funny, wickedly candid tale; a story of hope and renewal that turns all of the "knowns" upside down. My thoughts: This was a stunningly honest look at what happens when one woman's life gets turned upside down, that all she thought she knew to be was not to be. Told at one point that she was infertile, imagine what goes through her mind to be told, at age 44, that she is six months pregnant. And it's not as if she was trying to get pregnant so that she was taking prenatal vitamins and watching what she ate/drank. Now, past the point of a legal abortion, she must come to terms with this pregnancy. As she continues through the pregnancy, Alice makes no effort to hide the fact that she is ambivalent about this baby. I was hooked as soon as I started this book, and read it in one sitting. I found it to be compelling and terrifying at the same time - what if this were to happen to me; would I make the same choices Alice did; would I have the same thoughts going through my mind? I give props to Alice Cohen for not only having to go through this once, but then to purposely decide to relive it as she shares her story with us. 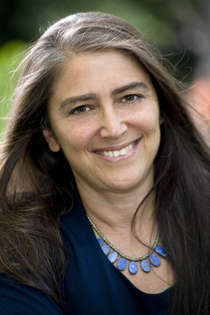 About the author: Alice Eve Cohen is a solo theatre artist, playwright, and memoirist. Her memoir, What I Thought I Knew (Viking, 2009) won the Elle's Lettres 2009 Grand Prix for Nonfiction. She has written for Nickelodeon, PBS, and CBS. Her plays have been presented at theatres throughout the country, and she has toured her solo theatre works internationally. Her writing about arts in education has been published in nine languages. The recipient of fellowships and grants from the New York State Council on the Arts and the National Endowment for the Arts, she holds a BA from Princeton University and an MFA from The New School. She teaches at The New School in New York City. 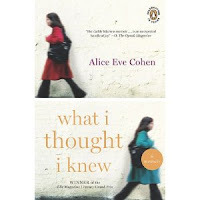 I received a complimentary copy of What I Thought I Knew by Alice Eve Cohen from Lisa at BookSparks PR to review. Lisa at BookSparks PR has provided one copy of this book for readers of this blog! To enter (required entry): Leave me a comment letting me know why you want to win What I Thought I Knew. Please include your e-mail address in your comment, so that I have a way to contact you if you win. No e-mail= no entry! I have heard such great things about this read - it was added to my wishlist recently! This book sounds so interesting, so great that she went ahead and did what her heart told her to do. The concept of this novel is interesting, I'm interested to know how she deals with this news and how she came to terms with it. I'm also an old google connect follower! I forgot to add that I am an old follower of this blog. This story line is similar to that of someone I know. I'd love to read this book to see how Alice handles this situation she finds herself in. You've done a great job of introducing the character and the plot, building it up to the point where one simply must read. Please enter me in the contest to win a copy of "What I Thought I Knew". I would really love to read this book. My husband and I are expecting our fourth child and this pregnancy was totally unexpected. I can definitly relate to the main character. I would love to read her story because I can relate just a little bit. I had a surprise pregnancy, too . . . far different circumstances, of course, but I can relate to that moment when you find out and think, "OMG, what now?" My little surprise will be 19 this Tuesday and can't imagine my life without him.